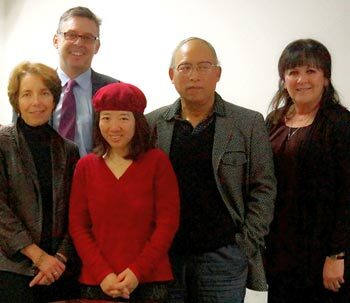 Joan Bottorff, Professor in the School of Nursing, UBC Okanagan and Director of the Institute for Healthy Living and Chronic Disease Prevention, John Oliffe, Professor in the School of Nursing, UBC Vancouver, Gayl Sarbit, Knowledge Broker, UBC Okanagan and Aimei Mao, Postdoctoral student at UBC are pictured here with Dr. Tingzhong Yang, Professor/Director, Centre for Tobacco Control Research at Zhejiang University, School of Medicine. Two UBC professors have been invited to join China’s Centre for Tobacco Control Research as International Senior Consultants. Prof. Joan Bottorff, of UBC’s Okanagan School of Nursing and director of the Institute for Healthy Living and Chronic Disease Prevention, along with Prof. John Oliffe, from UBC’s Vancouver School of Nursing, recently travelled to Zheijiang University in Hongzhou, China, for a six-day workshop to share their respective research expertise and to discuss the development of men-centred approaches for smoking cessation among Chinese men. China has the largest number of smokers in the world and is the largest producer of cigarettes. About 100 million people die each year in China from tobacco-related diseases. As well, there is a significant gender difference with more than 50 per cent of Chinese men smoking, compared to just three per cent of Chinese women. During the course of the workshop, the research team from Zhejiang University shared existing findings regarding patterns of smoking among Chinese men and described current approaches used for smoking cessation in China. The UBC team shared their research on the influence of masculinity on men’s smoking and described the innovative approaches developed and tested in Canada to support men’s smoking cessation. “This provided an exceptional opportunity to share our research and experiences in supporting the integration of smoking cessation interventions into the clinical practice of all healthcare professionals and to learn about tobacco control in China,” says Bottorff. Outcomes from this workshop included the development of a framework for a collaborative research proposal and plans for continued collaborations in joint research projects. A number of graduate students from Zhejiang University’s School of Medicine attended and discussions were held about developing further training opportunities for students and junior researchers from Canada and China. “This workshop marks the beginning of new opportunities for UBC faculty and students interested in tobacco control to share experiences and strengthen connections to support future research,” Bottorff says. It was supported with a grant from the UBC International Research Collaboration Workshop and matching funds from the Centre for Tobacco Control Research at Zhejiang University. The workshop was attended by senior scientists including Dr. Tingzhong Yang, professor/director, Centre for Tobacco Control Research at Zhejiang University, School of Medicine, along with the deputy-director of the Chinese Center for Disease Control and Prevention, director of the China Office, International Union Against Tuberculosis and Lung Disease, vice-president of Shanxi Medicine University, executive vice-director of the Center for Global Health at the School of Medicine, Zhejiang University, National Health and Family Planning Commission Official, as well as the China representative from the World Health Organization.